In late 2017, Mrs. GYFG and I decided that we were ready to embark on the next chapter of our lives, which involves expanding our family. We will be welcoming Baby GYFG in late 2018. We knew that this day would eventually come but it’s kind of crazy that it’s already here. As the first years of our marriage ticked by, we ignored all the commentary from our friends and family to just go ahead, that we could never truly be prepared, and still waited, taking steps to prepare for parenthood. We wanted to have things in place as we envisioned them before bringing another human being into this world. We march to the beat of a different drum! (1) We wanted to be at a certain place financially. Although we are both working professionals, and Mrs. GYFG doesn’t see herself as a future stay at home mom, we wanted the possibility space to revisit that decision. Meaning, we wanted to be in a financial position that allowed her to change her mind and stay at home with the kid(s), if desired, and not have it impact our current lifestyle. We decided this was comfortably possible once I (individually) was earning $250,000 annually. (2) We wanted to reach a certain level in our careers. Of course, it’s still possible to progress in your careers when you have kids, but I think it’s exponentially harder. There’s no better time to grind it out then in your 20s and early 30s with no kids. This is when you have the most energy and the least responsibility. I truly think that the 70-100 hour weeks I put in over the last decade to make the C-Suite by 30 were only possible because we made this conscious decision. (3) We wanted to be a couple before we had kids. One of the best lessons I learned from my in-laws is the importance of being a couple before rushing into becoming parents. We wanted to enjoy the DINK (Dual Income No Kids) life. We wanted to do a lot of traveling. By the time we got married, we had already been dating for seven years, and as I write this we have been married for six. We’ve had 13 incredible years to build a solid relationship and foundation for a family. (4) We wanted to be able to do things with friends on a moment’s notice. From the outside looking in, it looks incredibly more difficult to do this with kids of any age, let alone with an infant. As much as we plan the macro vision of our lives, we tend to do a lot of fun things on a whim in the micro day to day. Okay, so we know we are probably still in for a lot of surprises on the horizon, but we are entering this new chapter from a position of strength, which has put us in a better position to deal with and embrace those surprises. Now that I’ve set the stage for how we got here, let’s move into the topic of today’s post. Although I’m a big fan of the self-insured model, we aren’t there yet, and we want peace of mind in the event something happens to myself or Mrs. GYFG before we hit our $10M goal (or at least until we are technically FI, based on the 4% rule; more on this below). This is why we are in the market for term life insurance. The best time to get insurance is when you’re young and healthy. In my opinion, term life insurance is the best low-cost way to cover those low probability but potentially life-altering events. Our decision to start a family now presents us with a new dynamic to consider in our financial plan. It has motivated us to start taking additional steps to ensure the financial well being of our family. I want to go to sleep every night knowing that no matter what happens to me that my family is protected and provided for. Mrs. GYFG feels the same way, which is why we are obtaining a $2M policy on each of our lives (with a 20 year term). – As a 31-year-old male, I have a 0.15% chance of dying this year and can expect to live an additional 46.2 years (to ~77 years old) with a high probability. – As a 31-year-old female, Mrs. GYFG has a 0.07% of dying this year and can expect to live an additional 50.5 years (to ~82 years old) with a high probability. So, based on the actuarial science, you can see that we are covering a very low probability event. This insurance is “just in case.” No one is guaranteed a tomorrow, and it is possible a 31 year-old dies tonight in his or her sleep, but not very probable. Insurance exists to grant peace of mind and to free up the mental bandwidth occupied by worrying about such low probability events. Rule of thumb #1 – Multiply your income by 10. Rule of thumb #2 – Buy 10 times your income, plus $100,000 per child for college expenses. Rule of thumb #3 – The DIME (Debt, Income, Mortgage, and Education) formula. The idea here is that you back into your insurance needs by making sure there is enough to pay off any outstanding debt, including the mortgage. The amount would also be enough to replace your income for X number of years (determined by you and how long you think your family will need support) and enough to send your kid(s) to college. I think these are all great starting points, but insurance needs are going to vary wildly from one family to the next. Why $2M Each for Mr. and Mrs. GYFG? How did the GYFG household decide that $2M was the right amount of coverage? Why isn’t it $10M to align with that BHAG* goal? Also, what is the cost of that coverage? Before we decided on $2M, we reached out to a family member in the insurance business and asked for quotes on coverage for just me initially. We requested both ten year and 20 year terms in amounts of $1M, $5M, and $10M. We then realized that the 4% rule was probably very relevant in this exercise. For those unfamiliar with this rule, its underlying premise is that once you have accumulated 25X of your annual living expenses (one year is equal to 4% of 25X your annual spending), you have technically reached financial independence. This is just a rule of thumb, but it’s a great starting point for planning the possible and not very probable early demise. The 4% rule is supposed to provide you a ballpark figure of what size your nest egg would need to be to provide you the lifestyle you desire for at least 30 years without running out of funds. So, we calculated this number for us. For the past four years, our spending has ranged between $105,000 to $120,000. To be conservative we used the higher end at $120,000 and came to a target of $3,000,000. This allowed us to refine our insurance needs and then ask for quotes on $1M, $2M, and $3M policies (for both Mrs. GYFG and myself). Why didn’t we just go with a $3M policy? Well, because that didn’t consider all the variables. Although $3M is the number we agreed we needed, there was our current $725,000 net worth to consider, which offset the amount of insurance we needed. I also have a very cheap (+/-$3/month premium) $250,000 policy (as well as a $50,000 policy on Mrs. GYFG) through work to consider. Add those together and all of a sudden our need drops by $1M. As you can see from the table above, it’s going to cost about $112 per month for peace of mind (or $1,339 per year). If we keep the policies in place for the entire 20 year term, it will cost us $26,780. I personally think this is a relatively small price to pay to ensure that the GYFG family is protected and provided for in the unlikely event that one of us passes away early. Keep in mind that we are not obligated to keep the policy in force for the 20 year term. Once we are able to self-insure (when our net worth hits $3M), we can cancel the policies if we choose. We chose 20 years for the flexibility it affords in case something slows us down from hitting our goals. 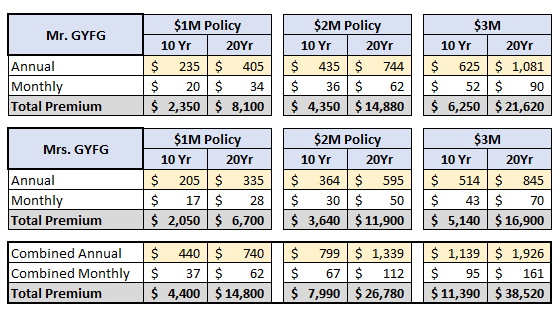 But based on the original 20 year financial plan we’ve designed, we should be in a position to self-insure by the year 2038 at the latest, or 2025 based on our current trajectory. Due to our young ages, current very good health, and progress to self-insure, we chose not to add coverage for Long-Term Care or private disability. LTC pays for extended health care after age 65, or at any age when you are unable to perform 2/6 activities of daily living. We may revisit that in coming decades. The aim of disability insurance is to protect your income until Social Security (and LTC) kicks in, in the event of a major disability. Since I have disability coverage through my job, as does Mrs. GYFG, we feel adequately covered there. There is a MUCH higher probability of being disabled young than of dying young. If you have no coverage for that, I suggest you do some research and make a choice that is right for your situation. Good starting point: Long-Term Disability Insurance (it’s aimed at physicians, but definitely appropriate for any high earners). Note: All the pricing for life insurance is based on your date of birth, your health, the coverage amount, and the term length. Insurance is a commodity product (Buffett repeats this over and over again in his annual letters) and we were advised to choose a cheap policy from a company with a great rating. The family member who ran the quotes for us procured quotes from 34 different companies, and we ended up choosing the cheapest policy from a company with a very strong rating. To qualify for life insurance there is an underwriting process. That includes filling out some application paperwork and a quick insurance exam. The application process is free – including the insurance exam. You don’t have to start paying until AFTER you are approved. The insurance exam takes about 20-30 minutes. The nurse will come to your home at a convenient time (before work, after work, weekends, etc.). The nurse will ask some medical questions, take your height, weight, blood pressure, a blood sample, and a urine sample. In some cases, if you apply for larger amounts ($3M and above), they may do a resting EKG. Pretty quick and easy process – in essence, you get a free mini-physical. Bonus! It’s your turn. What are your thoughts on term life insurance? Do you have a policy in place to protect your family? If you are the sole breadwinner, do you only cover yourself, or do you cover your spouse as well? How did you determine the amount of coverage? Awesome Dom, I’m so excited for you! You guys are gonna be fantastic parents. Enjoy your sleep now buddy. ???? No kids right now, but I have a 2 million 10 year term policy and 1 million 20 year term policy. My thinking is I should be able to build up a bigger next egg within the next 10 years that after that, my wife wouldnt need as much to live on. Full respect for this family GYFG choice. Outlay is a fraction of revenue, going forward, and the back-and-fill for future income is an invaluable asset for future planning. The amount of outlay, over the time considered, is easily something you can walk away from in 10 or 20 years, compared to where Mr. & Mrs. and bab(ies) will be situated. Your OODA loop is tight. (decision cycle of observe, orient, decide, and act.) Very Tim Ferriss. Wishing you GYFGs all the best! Gene Simmons book you recommended. On my OODA loop, with time being scarce, I try not to get caught up in analysis paralysis. Love Tim Ferriss. Our life insurance at a minimum pays off our home Times 2. How did you decide on the amount of coverage? I’m the sole breadwinner and we have coverage for both myself and my SAHD husband. My policy is larger than his (since I’m the breadwinner), but his policy would allow me to take a couple of years off from work until our kids are school-aged. I’ve been thinking about this recently after getting married. I’ll probably setup an emergency fund under my wife’s name in case anything happens to me.